A romantic Virgo and Scorpio relationship will be one that will be able to work through many difficulties that other zodiac sign pairings might not be able to do. These two star signs have many of the same qualities, but they also have their differences as well. For instance, in the Virgo Scorpio compatibility they both value loyalty and security in a relationship. But Virgo is influenced the most by Mercury, the communication planet, while Scorpio is ruled more by Mars and Pluto, so these signs are bound to be a at least a little different. The main question is whether or not their similarities will be strong enough to be able to overlook these sun sign’s differences from each other. Keep reading to find out! Virgo is a star sign that cares very much about loyalty and security. While Virgo is not a very social sign, they are loyal to the friends that they have, as well as their family members. They will never do anything to betray the trust of someone who they care about. Because of this, anyone dating a Virgo can rest assured that this sign will not cheat on them. Virgo men and Virgo women also crave to have as much security in their lives as possible. This could be one of the reasons why the Virgo person takes so much pride in their job, which can easily provide them with financial security. They don’t mind that they need to work, as they are good at their job. They pay a lot of attention to the small details in their job, their partner, and in life in general. They are unlikely to ever forget an appointment, birthday, or anniversary. Scorpio is not a very social sign, as they feel that they can get more work done if they work on their own. This is a trait that Virgo also shares with them. Like the Virgin, they realize that they won’t become boss of their workplace overnight. They will still work as hard as they can. They care more that they are doing their job well than that they are getting a promotion every few months. Scorpio men and Scorpio women set goals for themselves that may not be the easiest to accomplished, but they will work on their goal until they finally get it done, whether it takes a week or a year. This sign also loves to be creative, whether they are having new ideas at work, in an art studio, or in the bedroom. When the Virgo is dating a Scorpio, the Scorpion will want to be in charge. This could be seen as being possessive, but if they have a loyal partner they can tone themselves down a bit. Now that we’ve looked at these star sign’s traits it is easy to see some of their similarities that might be able to bring them together. 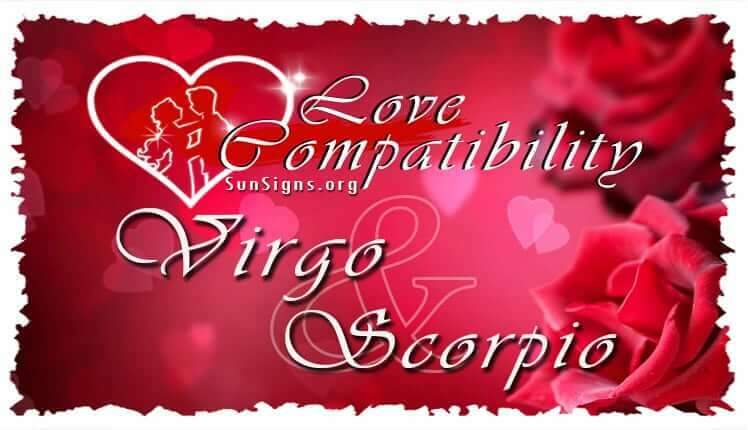 Let’s look at the pros of a Virgo Scorpio love compatibility. Although both these astrological signs are shy, it is likely that Scorpio will be the one to first approach Virgo, instead of it being the other way around. The Virgo man or Virgo woman is usually slow to getting into a romantic relationship. So it is likely that Virgo Scorpio friendship will be the first step before they get into a romantic relationship together. It is also likely that they will meet at work or school because neither of these astrology signs tend to go out much. Since the Virgo Scorpio soul mates are both hard-workers it is likely that they will be very stable financially. These two signs will respect each other’s ability to work like they do, since they both have the same tactic when it comes to do their job properly. These two are not likely to spend much of their money on things that they don’t need. Virgo is a practical spender and Scorpio can understand that. The Virgo and Scorpio couple may think about investing in the stock market together though. Although in the Virgo and Scorpio compatibility these two signs tend to be rather shy, they are great communicating with each other. This could be in part because Virgo is ruled by Mercury, and most signs under Mercury have great communication skills. These two signs are able to talk to each other for hours about the things that they are passionate about. These signs also love to teach each other new things. For instance, Scorpio personality might try to teach Virgo how to think more creatively and also teach them how to be more relaxed during the day. Virgo often puts so much emphasis on their work-life that their home-life becomes stressful because of it. The Scorpion understands that work is important, but they can teach the Virgin to leave their work-related stress at their job. Virgo will try to teach Scorpio much of the opposite skills. Although Scorpio male or Scorpio female is already a hard-worker and goal-driven, their creativity may get in their way at times. Virgo may help Scorpio to think less outside-of-the-box and think more practically instead. Overall, in the Virgo Scorpio marriage, the couple will try to bring out the best in each other, and try to improve each other as their relationship goes on. By looking at these pros it seems like the couple will be one that will have no problem with communicating with each other, which is always a good trait for a couple to have. While this couple has many great traits going for them, they also have some differences that can get in the way about how they feel about each other and how they act within their relationship. Let’s take a look at some of the cons of a Virgo Scorpio love compatibility. Sometimes Scorpios’ temper can get between this couple. Virgo is not the best when it comes to picking up on other people’s emotions, so it is likely that he or she won’t know what to do when the Scorpion is acting in this way. However, Virgo will do whatever their partner needs so that they can feel better. However, sometimes it takes a while for the virgin to understand what it wrong, and this can make their better half very upset. This can be the first step to arguments and general conflict leading to a Virgo Scorpio breakup. Luckily, Virgo zodiac is open to making compromises when Scorpio gets this way. At the same time, they can also be emotional. While they pride themselves on being organized on the outside, their feelings on the inside are more or less all over the place. In this horoscope compatibility, these two star signs will need to work on their individual emotional issues if they are even supposed to begin to help each other with their emotions. This can take some time to learn. They may want to seek couple’s counseling or go to therapists so that they can figure out how to deal with their emotions in a better way. Once they figure out how to deal with their individual emotions they should be better able to help each other with their emotions. The main problem in this Virgo and Scorpio compatibility is that these two will have trouble opening up with each other when it comes to their feelings. If this aspect of their relationship cannot be worked on then it is likely that this will be what breaks up the couple. Besides their emotional inner conflicts, the Virgo Scorpio in bed too will not be sexually satisfied. Scorpio will want to be able to make the main decisions for this pairing, so it will depend on how their Virgo partner feels about this if it will work out well. These two signs are great with compromise, but if Scorpio begins to get too demanding then things will not work out well. Just as well, at times Scorpio can become possessive of their partner if they have problems trusting them. This should not be a problem in most Virgo-Scorpio relationships But if Scorpio has the slightest thought that there is a reason not to trust the Virgo then things might get messy in their relationship. Luckily, Virgo is a very loyal partner, so this should not be a problem too often. In conclusion, a Virgo-Scorpio compatibility should be one that is able to work out through most of their problems. In this pairing, the main problem is that these zodiac signs are not very good at accepting and communicating their individual emotions. If these two can learn to express themselves better, then this Virgo and Scorpio relationship will have close to no problems. Overall, this couple will be very stable and they will be able to get along well because of their similarities.